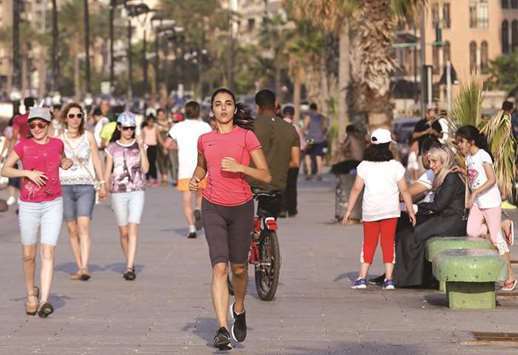 by AFP - Her trainers beating down on the pavement along Beirut’s seafront, Nour Safieddine, 24, cuts past strollers ambling in the evening sun. In her bright pink T-shirt, she is running to survive. “I run to carry on, so life can smile at me even if it made me cry – or in fact, not to die after the thought of suicide crept into my head,” the journalist and graduate student wrote recently. In Lebanon, mental health and suicide have long been deeply taboo subjects. But one in three adults in Lebanon will develop a mental disorder by the age of 75, a 2008 study found. The small Mediterranean country has been rocked by decades of war, and weathered endless political crises in recent years as it fights to stave off an economic meltdown. To shake the mould and help save lives, Lebanese like Safieddine are speaking up. The sudden deaths of her sister and father around one year ago sent her into crippling depression, but running has helped pull her out. In May, she bravely shared her own struggle with depression in a public social media post. “I decided I had to give positive energy to these people and remind them that life is worth living and that they deserve to live,” the tall, lean athlete told AFP. She was surprised by the positive response. “I felt like my experience was the experience of many people who hadn’t dared to speak up about what they were going through,” she said. The issue has been getting a wave of attention in Lebanon in recent weeks amid concern over rising suicides. The first seven months of this year alone have seen 89 suicides in Lebanon, compared with 143 for all of 2017, according to Lebanon’s security forces. This year’s rate amounts to roughly one suicide every two-and-a-half days, but social norms in Lebanon may mean suicides are underreported. “You have families who said, because of stigma, that he fell,” said Nour Kik, of the health ministry’s mental health programme. To fight rising numbers, a group of mental health professionals and volunteers launched h Lebanon’s first suicide prevention hotline in late 2017. The Embrace Lifeline has received around 600 calls since November, said Omar Ghosn, a psychiatrist and board member of the Embrace association behind it. In a small, bright office in downtown Beirut, around 45 volunteers work in shifts to receive phone calls from people in distress, but also worried relatives or friends. “Callers are women and men of all ages,” but teenagers especially rely on the service, said Sally, who like other hotline volunteers did not give her second name. “I’ve had a lot of calls from elderly men,” said the 22-year-old psychology student. Without work or a pension, “most call upset because they’re struggling to provide themselves with food, drink – or even a home”. But vulnerable groups in Lebanon also include around 1mn Syrian refugees who fled the seven-year war in their neighbouring homeland. A 2014 World Health Organisation report found that 41% of Syrian youth in Lebanon have sometimes or often contemplated suicide. Fadi, a 37-year-old Syrian volunteer at the hotline, said he often feels callers have never had anyone empathise with them. He talks them through their problems, trying to highlight their achievements, he said. Though “sometimes, they just need someone to listen to them cry”. Fadi is determined to speak out, especially after witnessing a crowd egg on a suicidal man threatening to throw himself off a Beirut cliff in April.